The Art of the Ancient Americas Collection includes objects created for ceremony, adornment and use in the afterlife by more than 35 ancient cultures. For thousands of years before the arrival of Europeans, native cultures from the deserts of the American Southwest to the southern Andes Mountains of Peru thrived in complex societies. Many lived in towns and cities with great architectural monuments and long histories of political and religious organization. For all of these people, art was of central importance in expressing the values and beliefs of their culture. 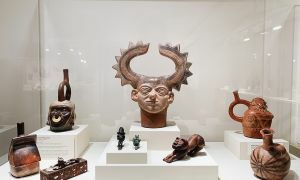 The Orlando Museum of Art’s Art of the Ancient Americas Collection has more than 900 works of art that includes polychrome pottery, carved jade and stone, intricately worked gold and silver and skillfully woven textiles. The artistic methods are as varied as these cultures, ranging from the naturalism of ceramic sculptures made by the Colima, Maya and Moche to the more abstract designs in gold of the Diquis and carved stone of the Mezcala. A number of cultures represented in the collection were active at the time of European contact in the early 1500s. The best known of these are the Aztec of Central Mexico and the Inca of Peru. Many other cultures that thrived for long periods before vanishing or being absorbed by later civilizations are also represented. 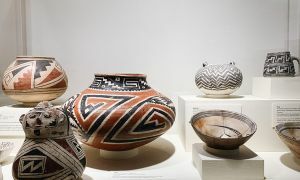 The Art of the Ancient Americas Collection began with a major gift in 1972 by collector Howard Campbell that became the nucleus of the Collection. Throughout the years the Collection has grown incrementally with numerous gifts from individuals. In 1997, another major gift from James F. Turner, Sr. of 160 Mexican Chupicuaro figurines was added. From 2001-2004, other large gifts from the collection of Dr. and Mrs. Solomon D. Klotz added 280 objects to the collection from Peruvian cultures. Today, the Collection is the most comprehensive of its kind in among museums in the Southeast United States.